এলাহাবাদ(প্ৰয়াগ), হৰিদ্বাৰ, নাচিক আৰু উজ্জয়িনী এই চাৰিখন ঠাইৰ একোখনত ১২ বছৰৰ মূৰে মূৰে কুম্ভ মেলা অনষ্ঠিত হয়। . According to The Imperial Gazetteer of India, an outbreak of cholera occurred at the 1892 Mela at Haridwar leading to the rapid improvement of arrangements by the authorities and to the formation of Haridwar Improvement Society. In 1903 about 400,000 people are recorded as attending the fair. During the 1954 Kumbh Mela stampede at Prayag, around 500 people were killed, and scores were injured. Ten million people gathered at Haridwar for the Kumbh on 14 April 1998. In 2001, more than 40 million gathered on the busiest of its 55 days. According to the Mela Administration's estimates, around 70 million people participated in the 45-day Ardha Kumbh Mela at Prayag in 2007. The last "Kumbh Mela" held in 2001 in Prayag was estimated by the authorities to have attracted between 30 and 70 million people. 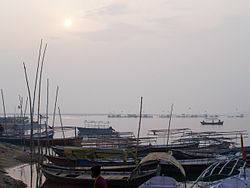 The current Maha Kumbh Mela began on 14 January 2013 at Prayag. According to expectations more than 100 million people attended the 2013 Kumbh mela. এই উৎসৱৰ মূখ্য ৰীতি হৈছে যি খন নগৰত কুম্ভমেলা হৈ আছে সেই নগৰৰ নদীত ধৰ্মীয় ৰীতি-নীতিৰ সৈতে সামূহিক স্নান কৰা:Ganga , নাচিকত গোদাৱৰী , উজ্জয়িনীত শিপ্ৰা আৰু সংগম (confluence of Ganga, Yamuna and mythical Saraswati) in Allahabad (Prayag). Nasik has registered maximum visitors to 75 million. Other activities include religious discussions, devotional singing, mass feeding of holy men and women and the poor, and religious assemblies where doctrines are debated and standardised. Kumbh Mela is the most sacred of all the pilgrimages. Thousands of holy men and women attend, and the auspiciousness of the festival is in part attributable to this. The sadhus are seen clad in saffron sheets with Vibhuti ashes dabbed on their skin as per the requirements of ancient traditions. Some, called naga sanyasis, may not wear any clothes even in severe winter. The right to be naga, or naked, is considered a sign of separation from the material world. Darshan, or respectful visual exchange, is an important part of the Kumbh Mela. People make the pilgrimage to the Kumbh Mela specifically to see and experience both the religious and secular aspects of the event. Two major groups that participate in the Kumbh Mela include the Sadhus (Hindu holy men) and pilgrims. Through their continual yogic practices the Sadhus articulate the transitory aspect of life. Sadhus travel to the Kumbh Mela to make themselves available to much of the Hindu public. This allows members of the Hindu public to interact with the Sadhus and to take "darshan." They are able to "seek instruction or advice in their spiritual lives." Darshan focuses on the visual exchange, where there is interaction with a religious deity and the worshiper is able to visually "'drink' divine power." The Kumbh Mela is arranged in camps that give Hindu worshipers access to the Sadhus. The darshan is important to the experience of the Kumbh Mela and because of this worshipers must be careful so as to not displease religious deities. Seeing of the Sandus is carefully managed and worshipers often leave tokens at their feet. ↑ 1.0 1.1 "India's Kumbh Mela festival holds most auspicious day". BBC News. 11 February 2013. http://www.bbc.co.uk/news/world-asia-india-21395425. ↑ Sugden, Joanna (2 February 2013). "How the Kumbh Mela Crowds Are Counted - India Real Time - WSJ". The Wall Street Journal. Wall Street Journal. Archived from the original on 3 February 2013. https://web.archive.org/web/20130203190735/http://blogs.wsj.com/indiarealtime/2013/02/02/how-the-kumbh-mela-crowds-are-counted/। আহৰণ কৰা হৈছে: 26 May 2014. ↑ 3.0 3.1 3.2 McLean, Kama. ↑ 5.0 5.1 Kumbh Mela – Timeline What Is Hinduism? : Modern Adventures into a Profound Global Faith, by Editors of Hinduism Today, Hinduism Today Magazine Editors. ↑ Kumbh Mela Channel 4. ↑ Ramayana, Book I; Canto: XLV – The Quest for the Amrit Ramayana of Valmiki. ↑ Urn Festival Time, 1 May 1950. ↑ K Shadananan Nair, "Role of water in the development of civilization of India: A review of ancient literature, traditional practices and beliefs", pp. 160–166 of The Basis of Civilization: Water Science?, ed. ↑ John C. Rodda; Lucio Ubertini; Symposium on the Basis of Civilization Water Science ( (2004). Water Science. IAHS Press. পৃষ্ঠা. 165–. ISBN 978-1-901502-57-2. http://books.google.com/books?id=JI65-MygMm0C&pg=PA165। আহৰণ কৰা হৈছে: 15 January 2013. ↑ Gopal, Madan (1990). K.S. Gautam. ed. India through the ages. Publication Division, Ministry of Information and Broadcasting, Government of India. পৃষ্ঠা. 173. ↑ "Purna Kumbh Mela at Prayag". Explora Films. http://www.ekantipur.com/np/2070/12/17/full-story/386629.html। আহৰণ কৰা হৈছে: 24 October 2012. ↑ Huston Smith; Phil Cousineau (4 September 2012). And Live Rejoicing: Chapters from a Charmed Life: Personal Encounters With Spiritual Mavericks, Remarkable Seekers, and the World's Great Religious Leaders. New World Library. পৃষ্ঠা. 73–. ISBN 978-1-60868-071-9. http://books.google.com/books?id=k77hAZmFw2IC&pg=PA73। আহৰণ কৰা হৈছে: 15 January 2013. ↑ Chris Philpott (24 January 2011). Green Spirituality: One Answer to Global Environmental Problems and World Poverty. AuthorHouse. পৃষ্ঠা. 45–. ISBN 978-1-4520-8290-5. http://books.google.com/books?id=cYp1essuTpIC&pg=PA45। আহৰণ কৰা হৈছে: 15 January 2013. ↑ 16.0 16.1 "Lakhs take holy dip as `Maha Kumbh` begins". zeenews.india.com. 2013. http://zeenews.india.com/news/uttar-pradesh/lakhs-take-holy-dip-as-maha-kumbh-begins_822770.html। আহৰণ কৰা হৈছে: 15 January 2013. "millions of pilgrims in taking a holy dip in the Sangam the confluence of Ganga, Yamuna and mythical Saraswati"
↑ "Preparation for 2015 Kumbh caught in bureaucratic procedures, politics". The Times of India. 2012. http://articles.timesofindia.indiatimes.com/2012-11-25/nashik/35347359_1_kumbh-mela-nashik-finalise। আহৰণ কৰা হৈছে: 15 January 2013. "The Shaiv Akhadas take a holy dip at Kushavart in Trimbakeshwar"
↑ "Shahi Snanam begins at Kumbh Mela". mid-day.com. 2003. http://www.mid-day.com/news/2003/aug/60949.htm। আহৰণ কৰা হৈছে: 15 January 2013. "The Vaishnavites have a bath in Nashik, while the Shaivaites at Trimbakeshawar." ↑ "Madhya Pradesh clears Rs 192 crore for water facility during 2016 Kumbh Mela". Ahmedabad Mirror. 2012. http://www.ahmedabadmirror.com/index.aspx?page=article&sectid=4&contentid=201204102012041016205290656cf527c। আহৰণ কৰা হৈছে: 15 January 2013. "2016 Simhastha Kumbh Mela in Ujjain." ↑ Kumbh Mela Students' Britannica India, by Dale Hoiberg, Indu Ramchandani. ↑ 21.0 21.1 Haridwar The Imperial Gazetteer of India, 1909, v. 13, p. 52. ↑ Kumbh Mela 'Encyclopædia Britannica. ↑ "Ardha Kumbh – 2007: The Ganges River". Mela Administration. http://ardhkumbh.up.nic.in/ganga.htm। আহৰণ কৰা হৈছে: 2012-01-05. ↑ Kumbh Mela pictured from space – probably the largest human gathering in history BBC News, 26 January 2001. ↑ Kumbh Mela: the largest pilgrimage – Pictures: Kumbh Mela by Karoki Lewis The Times, 22 March 2008. ↑ "Millions of Hindus take to the Ganges at Maha Kumbh Mela | Reuters". Reuters. 14 January 2013. http://in.reuters.com/article/2013/01/14/india-allahabad-ganga-maha-kumbh-mela-idINDEE90D05Q20130114। আহৰণ কৰা হৈছে: 15 January 2013. "Officials believe that over the next two months as many as 100 million people passed"
↑ "Kumbh Mela: 'Eight million' bathers on first day of festival". BBC. 14 January 2013. http://www.bbc.co.uk/news/world-asia-india-21017217। আহৰণ কৰা হৈছে: 15 January 2013. "More than 100 million people attended the 55-day festival." ↑ "More trains during Kumbh Mela". The Times of India. 11 April 2010. http://articles.timesofindia.indiatimes.com/2010-04-11/lucknow/28126686_1_clear-extra-rush-return-direction-special-trains। আহৰণ কৰা হৈছে: 16 April 2010. ↑ "Allahabad stampede kills 36 Kumbh Mela pilgrims". Reuters. 11 February 2013. http://in.reuters.com/article/2013/02/11/kumbh-mela-stampede-allahabad-update-idINDEE91907I20130211। আহৰণ কৰা হৈছে: 2013-02-12. ↑ "10 million to gather for 2015 Nashik Kumbh Mela". Zee News. http://zeenews.india.com/news/maharashtra/10-million-to-gather-for-2015-nashik-kumbh-mela_884065.html। আহৰণ কৰা হৈছে: 14 June 2014.